The MSC Maya, the fourth of 20 Oscar-Class Ultra-Large Container Ships (ULCS), arrived at APM Terminals Gothenburg on December 21 from the Port of Bremerhaven as part of the regular port rotation of the Maersk Line/Mediterranean Shipping Company AE-2/Swan Far East/North Europe Service in the 2M alliance. With a published capacity of 19,224 TEUs, Oscar-class vessels are the world’s current record holders in container carrying capacity. These ULCS are 396 meters-long, and require a depth of 16 meters. 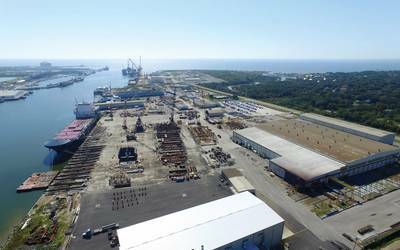 “This is the only port in Sweden with a water depth to handle vessels this large”, noted APM Terminals Gothenburg Vessel Planner Peter Hägg, who has since early December been preparing the operational details of the MSC Maya’s arrival. The MSC Maya will be in port for only a total of 35 hours. A total of 50 port staff are assigned to work three shifts to move containers onto and off of the vessel. The logistics have been planned down to the smallest detail. Crane operations, and container movements in the yard performed by straddle carriers are part of the optimized operations to ensure maximum productivity during the vessel call window. The final vessel loading and unloading planning was completed 24 hours before arrival, to take account weather and wind conditions, as well as the exact arrival time of the ship at the port. In January 2016, APM Terminals Gothenburg will host the MSC Zoe, the next of the Oscar-class vessels entering into the MSC fleet. APM Terminals Gothenburg began operations in January of 2012, after being announced the winner of the concession bidding process for the existing Skandia Container Terminal concession in October 2011. The company is investing USD 115 million in the facility to establish Gothenburg as a deep-water hub for Scandinavia and the Baltic area. Gothenburg’s overall container throughput was 837,000 TEUs in 2014, with APM Terminals Gothenburg handling 759,000 TEUs, or approximately half of all Swedish container traffic for the year.